In his “Letter from a Birmingham Jail,” King artfully explains the motivations behind his campaign of non-violent protest. The impetus behind this masterful work was a newspaper article written by eight white Alabama clergymen. In the article, the clergymen condemned King’s style of leadership and his tactful, albeit effective method of protest—non-violent resistance. In response, King wrote a brief treatise that is the distillation of his philosophical and ideological beliefs. In contrast to the “superficial social analysis” made by the clergymen, King makes a series of stark and penetrating social critiques that expose the racist power structure—and deeply entrenched systemic racism—that dominates both the Southern and Northern United States. In the process, King not only justifies non-violent protest as a mechanism of change, but holds it up as a liberating force that transmutes hatred into love. 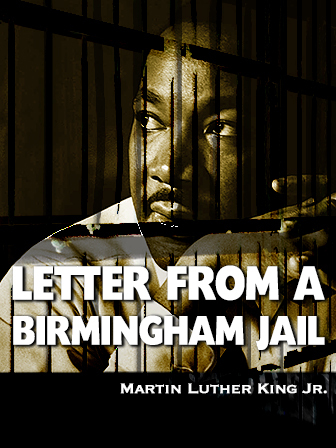 King’s “Letter From a Birmingham Jail” is a piece that compliments any introductory lesson on Civil Rights, with a particular focus on the life and works of Martin Luther King, Jr. This piece also works exceptionally well as part of a larger lesson that aims to contrast King’s pacifistic beliefs with the more militant side of the Civil Right’s Movement, best represented by Malcolm X, The Nation of Islam, and the notorious Black Panther Party. Furthermore, “Letter From a Birmingham Jail” is an invaluable part of any lesson on rhetoric, social injustice, the political history of the 1960’s, and the philosophy of law. Talk in small groups, and think about what makes a law just or unjust. Do you believe that all laws are just? Do you believe, in some circumstances, that its okay to break a law? Class Discussion: Imagine the following scenario. A friend in school is being bullied by another, much larger student, and your friend employs the tactic of non-violence. What are the benefits and drawbacks of this type of action? This link provides an in depth analysis and summary of King’s “A Letter From a Birmingham Jail,” that would be invaluable for any teacher to strengthen his/her understanding of King’s arguments. In this summary, the author outlines the nine criticisms made by King’s dissenters, in the newspaper article that provoked his letter, and explains how King systematically counters each criticism. This link provides a short, but no less effective, timeline of Martin Luther King, Jr.’s life. This piece can help students understand the events and experiences that lead up to King’s brief period of incarceration in Birmingham, Alabama.